The Anchorage01263 715779work01603 870304fax Self-cateringSet in an enviable position on the cliff tops, the Anchorage provides simple yet comfortable accommodation on one level. Mundsley is famous for its endless sands and dunes, the perfect location for a traditional seaside holiday. The Anchorage enjoys an excellent cliff-top position with sea views. 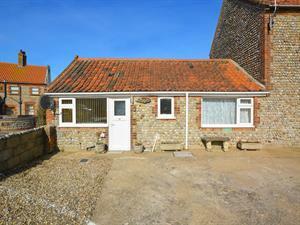 The cosy accommodation is well maintained and simply presented - an ideal base for a seaside holiday. Set in an enviable position on the cliff tops, the Anchorage provides simple yet comfortable accommodation on one level. Mundsley is famous for its endless sands and dunes, the perfect location for a traditional seaside holiday. Take the B1145 to Mundesley. From centre head towards Bacton. Property is opposite Seaview Hotel. From Norwich - 15 miles Train from Norwich to North Walsham then bus or taxi.